Located in Oxford county near the border of New Hampshire, Bethel, Maine is located on the site of a former Abenaki settlement. Bethel, Maine is a the largest ski town in Maine – home of the massive Sunday River Ski Area and Resort. On March 10, 1851, the Atlantic and St. Lawrence Railroad opened to Bethel, carrying freight and summer tourists eager to escape the noise, heat and pollution of cities. From the Civil War to the first World War, Bethel was a fashionable summer resort. Many prestigous hotels were built facing the common or on Bethel Hill. The Prospect Hotel, destroyed by fire in 1911,was the largest of the Bethel grand hotels, with a cupola from which guests could observe the mountains. 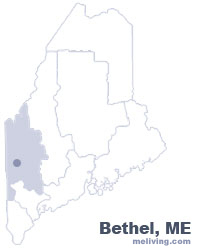 To share any Bethel, Maine information with us, please contact us. Learn more about advertising in MELiving.